What input to 'bny' produces the error? When I input 0 or 1 there is no error. Also, copy-paste the full error message. Vectors must be the same length. For input '100110', the variable 't' (below) will be a vector with 601 elements. The for-loop (below) will have 6 iterations so the variable 'y' created within the for-loop will be a vector of 6 elements. I haven't gone through your code to understand what you're trying to do but this explains the source of the error. Can you explain the purpose of the code, the inputs and expected outputs? 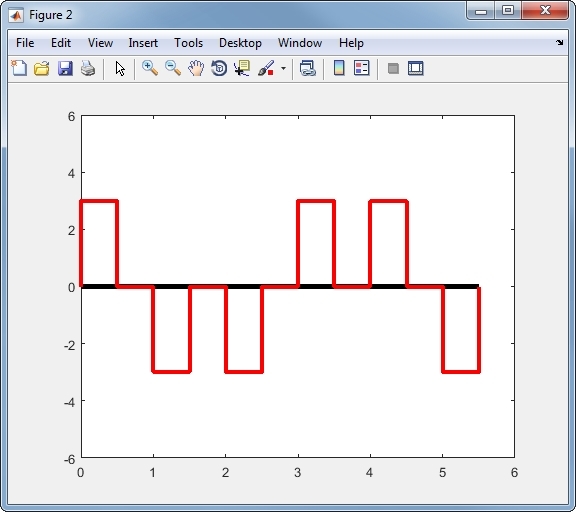 Sure.The purpose is to make a simulation of a RZ coded digital signal. The input is to add the 1´s and 0´s (binary) that will be coded. The expected output would be a grafic that when value is "1" it would go y=3 (and then halfway point it would go down to the middle again) i will show a image of that down below. After understanding the purpose of the code in the comments under the question, I rewrote the code to produce a plot that was described above. If this isn't what you were looking for or if you have specific quesitons about your original code, I'd be glad to help more. Thank you so much. It works great. But my question if it is possible to be de user to chosse the 0's and 1's insted of doing it on the code. Absolutely. Just replace the line #2 of my code with line #1. Wow, this is working really nice. Thank you so much!!! Priciate your time. Just one last thing. If i wanted to block the user from using other numbers (not allow him to use numbers besides 0 and 1) how would i do it? YOu need to rethink on your code.